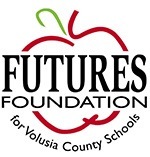 The Consortium of Florida Education Foundations (CFEF) recently awarded FUTURES Foundation for Volusia County Schools $82,604 in matching funds through the Florida legislatively funded School District Education Foundation (SDEF) Matching Grant Program. Through an annual school grant application process facilitated by FUTURES Foundation, 15 projects featuring tutoring and/or literacy programs for at-risk students within 12 Volusia County schools will be funded through this SDEF Matching Grant Program. Participating elementary schools include Blue Lake, Citrus Grove, Cypress Creek, DeBary, Horizon, Pathways, Pine Trail, R.J. Longstreet, Sweetwater, Timbercrest and Tomoka, as well as Spruce Creek High. All SDEF school projects align with the Strategic Plan for Excellence for Volusia County Schools which includes the school district's goal to meet and/or exceed state and national averages for district achievement on state assessments in reading, math, writing and science. The FUTURES SDEF grant project focuses on improving student achievement by funding school projects fostering student involvement in extra-curricular and tutoring activities and through project-based learning to increase student access to digital learning tools. Through academic achievement, personalized learning, rigorous curriculum and implementation of programs, the participating 12 schools can specifically target the lowest quartile students and increase their performance targets. The local grant’s projects support overall effective remediation/intervention programs for targeted students not mastering grade-level and/or course standards. 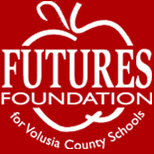 Through the collaborative effort of its members, the CFEF successfully advocated for the creation of legislative matching funds in 2000 which has provided a dollar-for-dollar incentive for local education foundations such as FUTURES Foundation to raise private contributions for eligible projects. Since then, nearly $92 million in combined private and state dollars has been employed for local projects that serve low-performing students and literacy initiatives, encourage STEM and career/technical education, improve teaching quality, and/or increase graduation rates. The CFEF is the membership organization for Florida’s school district-wide local education foundations. Established in 1987, the CFEF maximizes the individual and collective strength of Florida local education foundations to support local partners and schools in achieving student success. The CFEF now has 65-member foundations with 1,100 business and community leaders serving as volunteer board members. Collectively, they raise $64 million annually to support students, teachers and schools through a variety of programs. The CFEF has facilitated more than $46 million to local education foundations since 2002 through various private- and public-sector partnerships, including the State of Florida School District Education Foundation Matching Grant Program. To learn more about the CFEF and the statewide impact of the program, visit www.educationfoundationsfl.org.